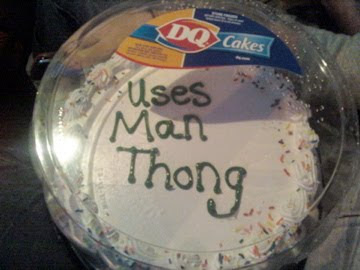 Tonight, while you're out ringing in the new year, please be considerate of your fellow cake lovers. 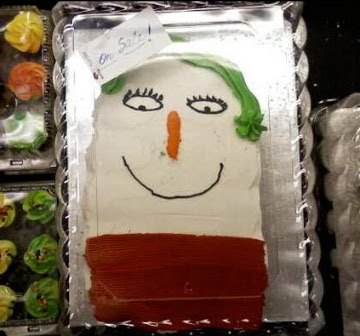 Please, don't drink and decorate. 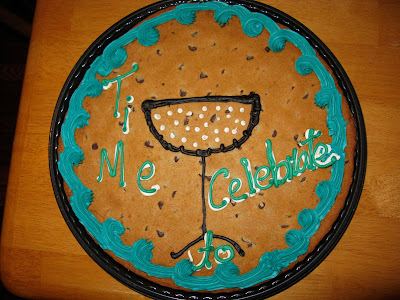 Thanks to Jan F., who plans to confiscate everyone's piping bags before serving the champagne tonight. Good plan, Jan, good plan. My, my. "Daddy" looks rather flushed, doesn't he? 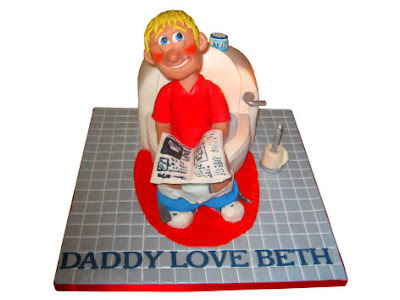 Frankly, I'm not sure which would be more disturbing: a father giving this cake to his daughter, or someone referring to any kind of toilet activity as "daddy love." [gagging] Yeah. Ok, well, if you'll excuse me, I have to go hack up a hairball now. Americans, by and large, are fat. I'm an American, and I'm fat. Together with 64% of my fellow citizens, we're taking over the country, one chocolate-covered bacon maple donut bar at a time. Rather than get all down and out about it, though, I like the bakeries' approach: simply upsize all of our childhood icons to fit the times! Whoah. 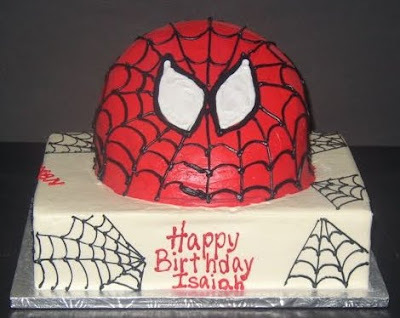 Uh, Spidey, listen: I'm all for embracing your body image, but at some point spandex stops being your friend. 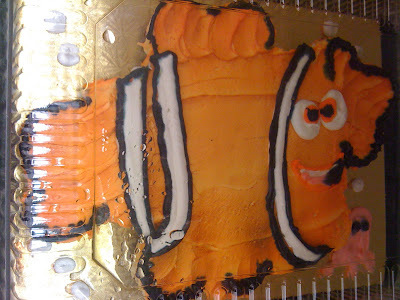 "Something seemed fishy about Nemo's new 'power diet.' 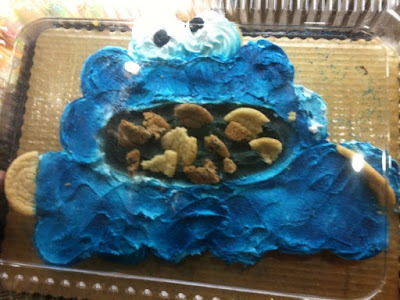 And where was Bloat the puffer fish, anyway?" 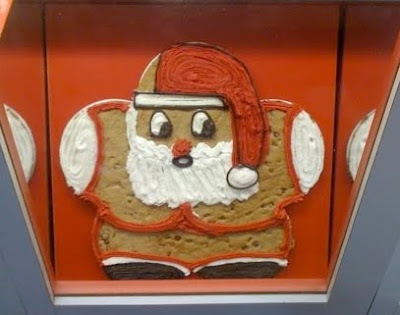 Still, I'm guessing this was taken during his "Robert Downey Jr of Cookies" years. when you eat up all that ham!" "Tink noticed it was taking a lot more pixie dust than usual to get off the ground these days. Peter, wisely, said nothing." Remember, Melissa W., Jen S., Dawn G., Amanda L., & Cindy S., there's an upside to everything: fat people are much harder to kidnap. 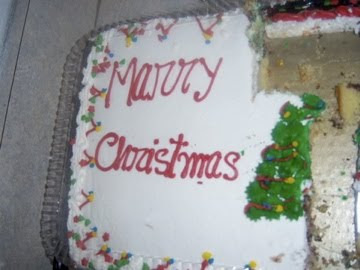 - Related Wreckage: Does This Cake Make Me Look Fat? 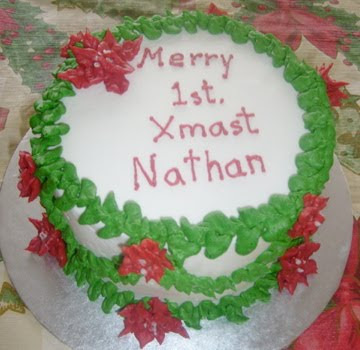 We all know that nearly all cake decorators misspell "congratulations" every day. This is obviously because they're either drunk or completely incompetent. Now you might be saying, "I thought all drunk and completely incompetent people were politicians?" But you would be wrong! 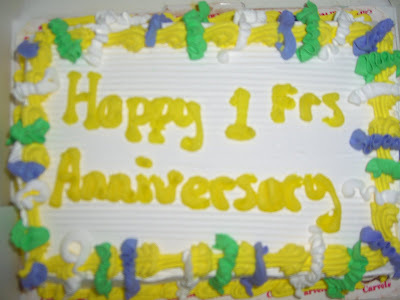 Which brings us back to cake. See? Comgratation. 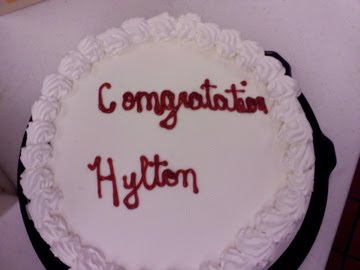 Interestingly enough, there are close to 3,000 accepted spellings of "congradulationed" in the decorators' dictionary. Like so. Of course, sometimes after successfully spelling a word the thrill goes to the baker's head. 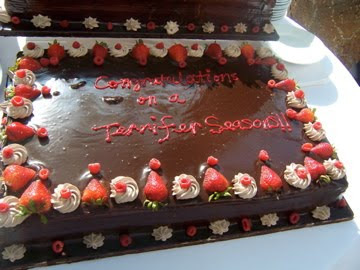 Thusly we get "Ternifer" - a hybrid creation of "Terrific" and the name of the person who ordered the cake, perhaps? Sure, the number's a bit, well, wrong...but hey, numbers are hard! Wisites: n. [wi-SET-eez] Small, fuzzy mammals indigenous to Uganda prized for their venom, which is said to cure gout and certain types of restless leg syndrome. Well, y'all have a grrr-reat day now. 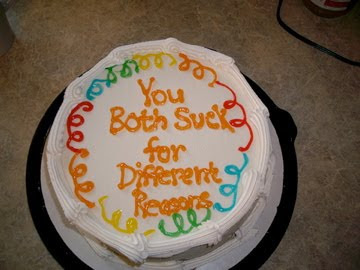 Oh, and decorators? Bottoms up! Jessica E., Christy C., Dana S., & Jessica, watch out; I hear those wisites spit. - Related Wreckage: The "Year" of the "Grad"
My my my. 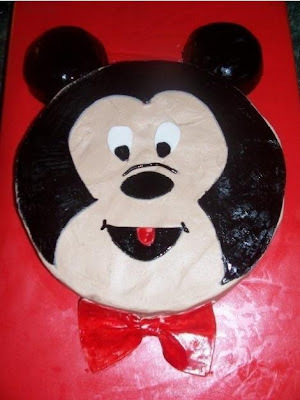 This was certainly a labor of love, wouldn't you say? 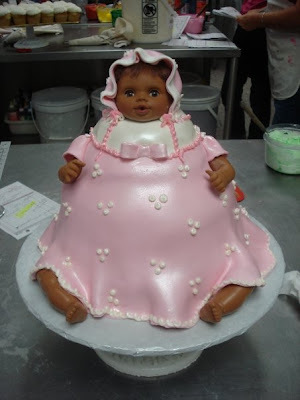 When this baby sits around the cake stand, she really sits around the cake stand! 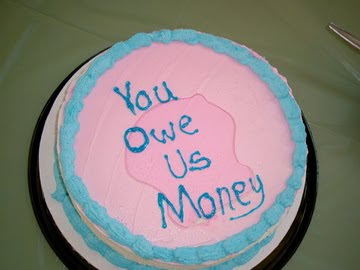 Forgive me if this seems disjointed (since I'm just shooting from the hip here), but methinks the baby shower cake has now officially gone belly up. 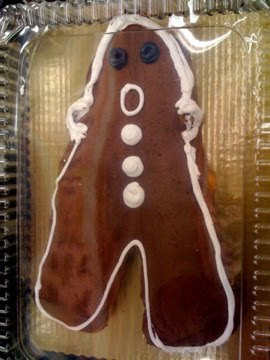 Next time maybe we should avoid telling the baker to break a leg - eh, Geri B.? 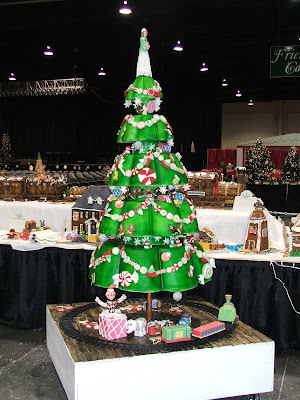 Today's Sweet comes from five cake decorators who made an extreme Christmas Tree cake for the Festival of Trees in Utah to benefit Primary Children's Medical Center. 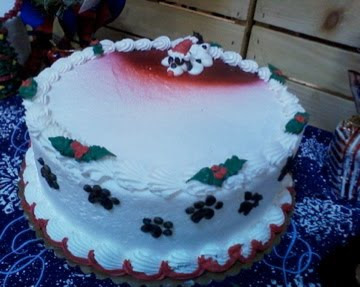 Since the cake was itself made to benefit a charity, I thought it would be a fitting way to wrap up our Charity Countdown. Love the train and wood-graining. 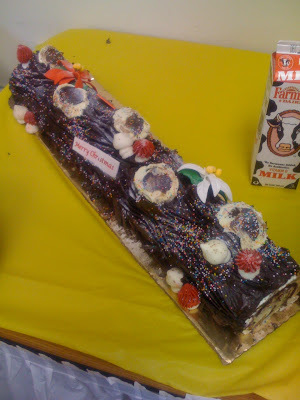 It's hard to believe that tiny tree trunk can hold up such a huge five-tiered cake! 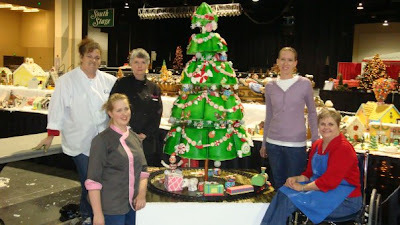 That's Amelia Carbine of Frosted Fantasy Cakes, Dianne Holgate of Cakes by Dee-sign, Tara Churchill, Paula Ames of Cake Creations, and Lynn Winter of Sugar Bakers. We finished our 14 days of giving on Christmas Eve (go here if you don't know what this is about), and I'm proud to say that together we gave a lot of money to some fantastic organizations! We haven't quite reached all of our goals, though, so if you haven't had the chance to give your dollar yet there's still time to donate! St. Jude Children's Research Hospital - Sorry, we didn't set up a page to track these donations. But you know you gave, right? So that's all that matters. Heifer International - $5,770 raised online so far. Again, that's over halfway to our $10K goal! Child's Play - since they also accept Paypal (and prefer it if the donation is more than $1), we don't have totals for Child's Play. On our First Giving page we've had $2,072 given - but again, the majority of us gave via Paypal. Share Our Strength - Initially featured on Day #2 of the Countdown, so a lot of you donated before we had a way of keeping a tally. (Had to switch to St. Jude because the site wouldn't accept $1 donations.) On our First Giving page now, though, we have $2,783. Puffy Paws Kitty Haven - Another with two options to give, but we've talked to Rick & Chrissy and they reported well over $5,000 given through Paypal. So combined with the $5,186 on the FG page, that's over $10,000 - or enough to feed and house the cats for over 3 months, plus pay for the de-worming meds they needed. Thanks for helping meet some serious needs, guys! Doctors Without Borders - $4,723 raised online so far - not quite halfway to our $10K goal. Love 146 - $9,025 raised so far for our $10,000 goal. So close! Oh, and you must read this amazing post by founder Rob Morris on the impact your comments and dollars have had. Habitat for Humanity - $2,090 raised so far of our $10K goal. Operation Smile - $2,712. To put that in perspective, that's 12 kids who will now have reconstructive surgeries thanks to your generosity. If we hit our $10K goal, that would be 41 kids. The Buckland Family Trust - The last time I spoke with Kristie, a close family friend, the Bucklands had received more than $14,000 dollars through Paypal. Awesome! Thank you for helping Amanda & her stepdaughter start to put the pieces of their lives back together. Free the Slaves - $1,759 so far of our $10K goal. These are all great causes, guys - if you're catching up, please be sure to check them out. To Write Love On Her Arms - $1,566 so far of our $10K goal. Give Kids the World - $2,193 so far of our $10K goal. 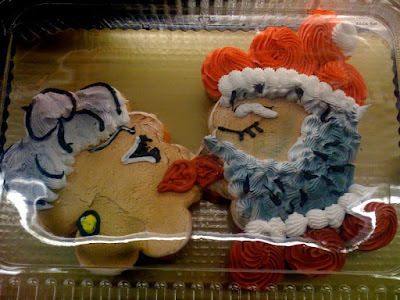 Preeeeesenting a sweet moment between Mr. & Mrs. Claus! 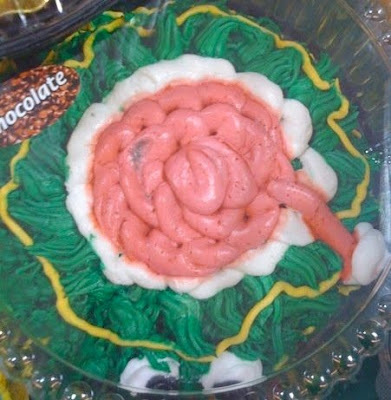 Oh, ick! What is going ON here? Hey, Drummer Boy! Could you play them off, please? Uh. You're not the Drummer Boy. "Nope. Sorry. But look! I'm on SALE! And if you like, I can play a little ditty on this here carrot-kazoo of a nose." 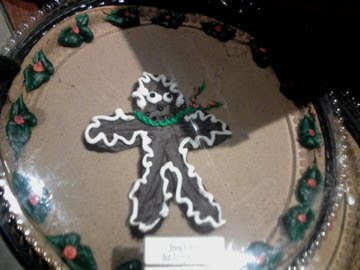 Jumping poo-streaked gingerbread, what is THIS? 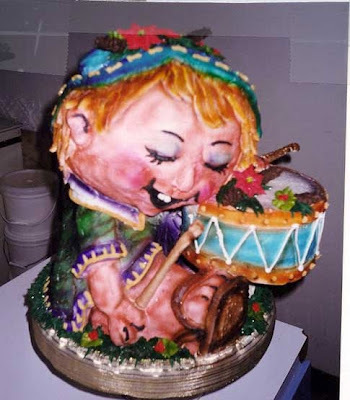 Drummer Boy, seriously, get in here and play this guy off. What the...seriously? 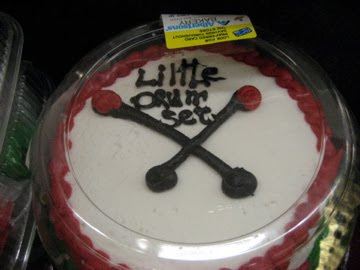 I ask for the little drummer boy, and you give me a "LiltLe Drum Set"? And how are two crossed matchsticks a drum set anyway? Drummer Boy? Are you finally ready? Oh, good. Please, proceed. YeeAAAAaaaah! Haha! Embrace the irony. If this post made no sense to you whatsoever, you might want to take a look at this. (Be aware some of the clips in that vid contain unfortunate accidents.) And if that still doesn't help, then I owe John five bucks. Thanks to David G., Sara K., Adriana B., Kim R., Malorie M., & Sondra D., for snaring these awesome Wrecks. 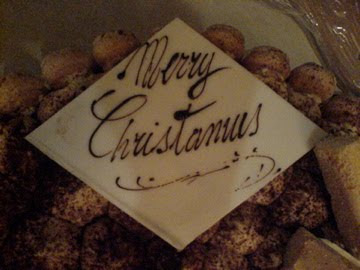 Why, marry Christmas, of course! 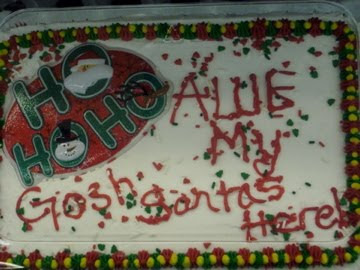 Although that giant smear of icing does make you wonder what it *used* to say. If you've been reading this blog for any length of time, then you know how important it is to get those writing and grammar skills ingrained at a young age. And I am so, so sorry. He does come bearing greetings, however. 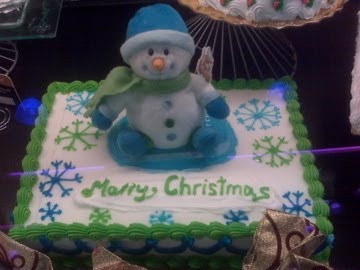 Although if you misspell "Christmas," then he's going to go all stony faced. Dude. Nick, seriously, try a little coffee or something. I think you're about to put the "pop" in "apoplexy." Well, happy Christmas, my dear Wreckies! Oh, and Krystle M., Michelle I., Jane K., Travis P., Sarah, Merideth S., Nils T., & Lisa H., also don't forget the importance of proper fiber intake. Just sayin'. 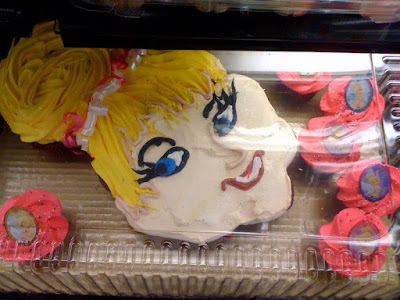 If you're like me, you may have seen cakes in your local bwreckery (<- New word! Booya!) that look a lot like logs. 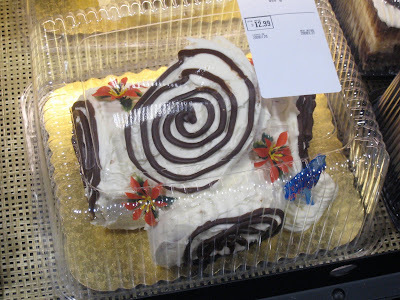 Yule logs, to be exact. And if you're like me, you may ask yourself, "Why do I always get the cart with the wonky wheel?" Which is a mystery. 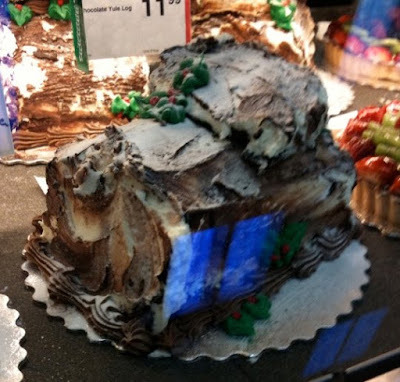 But you might also ask yourself, "Self, what is a Yule Log?" To which your Self might answer, "42" - at which point you should make a mental note to adjust any prescription meds you might be taking. I promised Jen this wouldn't be a knotty post! Ha! See, Jen? I can pun with the best of 'em. Look! 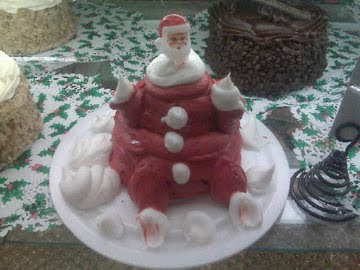 It's Santa riding a log! Oh, that sort of sounds suggestive. Uh. Never mind. Okay. Well how 'bout some other Yuley goodies? 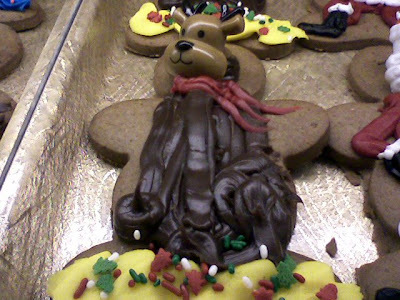 The Yule Corn-Nut Turd™©®Esq. MD. III. So there you have it. 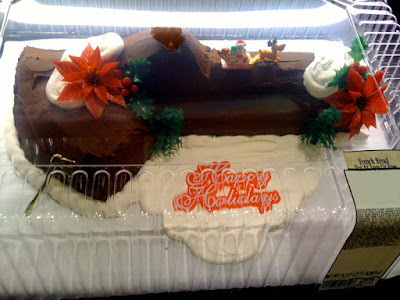 The Majestic Yule Log. All warm and fuzzy? Good, good. Thanks to Carrie F., Melissa B., Jenichan, Anna L., Shannon K., and Jessica S., who I'm sure know what the phrase "dropped a log" means, even if Jen doesn't. 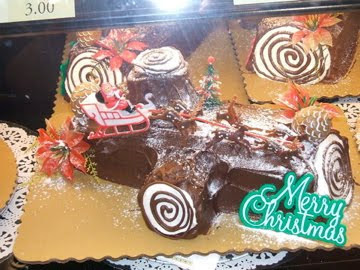 Note: Yes, yes, we know what a Yule Log is. It's the First Fruits tree branch that was carved into a Menorah and given to the Baby Jesus at Winter Solstice. And I'm pretty sure there were Pilgrims involved too. It's the last day in our charity countdown! Woohoo! So today, what with it being Christmas Eve and all, we thought we'd end with a charity that helps promote the wonder of the season year-round for kids who need it most: Give Kids the World. Click here to donate your dollar via our First Giving Campaign page. You Seinfeld fans probably remember the made-up holiday "for the rest of us": Festivus. For everyone else: hey, did you know there's a made-up holiday today called Festivus? 'Cuz there is. And folks celebrate it, too. "Dude! Not cool! I told you that in confidence!" "What? That was a gift!" So as you can see, the Airing of Grievances is a lot like your average family reunion. Finally, you wrap up the day's celebration with the traditional "Feats of Strength." Wow. 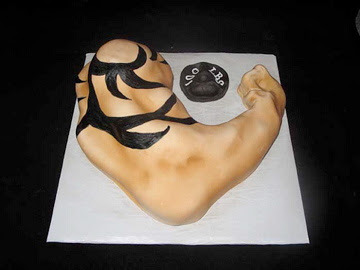 That's one disarmingly flexible cake. This is when the head of the household selects one family member to wrestle, since tradition states that Festivus is not over until the head of the household is pinned. 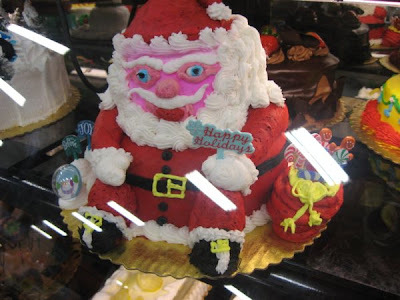 Of course, you can always count on someone to take tradition a little too far. 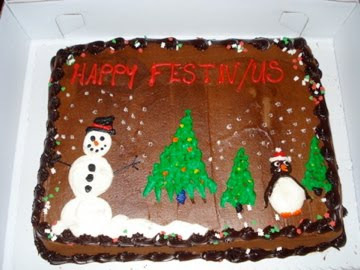 Well, Happy Festivus, Heidi B., Becky L., Wendy B., Rebecca B., & Lynn G.! Oh, and if you're not buying this, just read the Festivus book ; it's all in there. Today's charity, To Write Love On Her Arms, is dedicated to presenting hope and finding help for people struggling with depression, addiction, self-injury and suicide. The story behind their name is pretty darn cool, too. Click here to donate your dollar via our First Giving page. See, turned this way, it's an ugly, post-modern Christmas tree. and it's an ugly, post-modern dreidel! 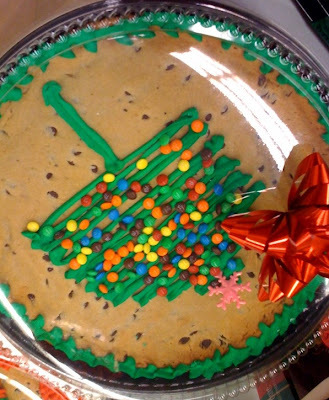 PLUS, you could count those M&Ms as Kwanzaa "first fruits" on a kinara (candle holder). In which case - booya! Three-in-one! Yeah, baby!! 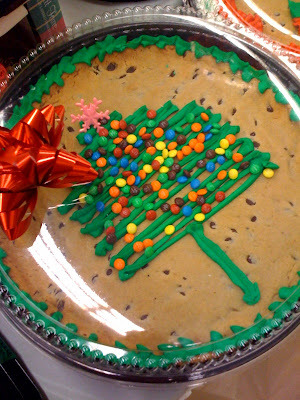 Jamie H., could world-wide religious harmony be brought about by a cookie cake? 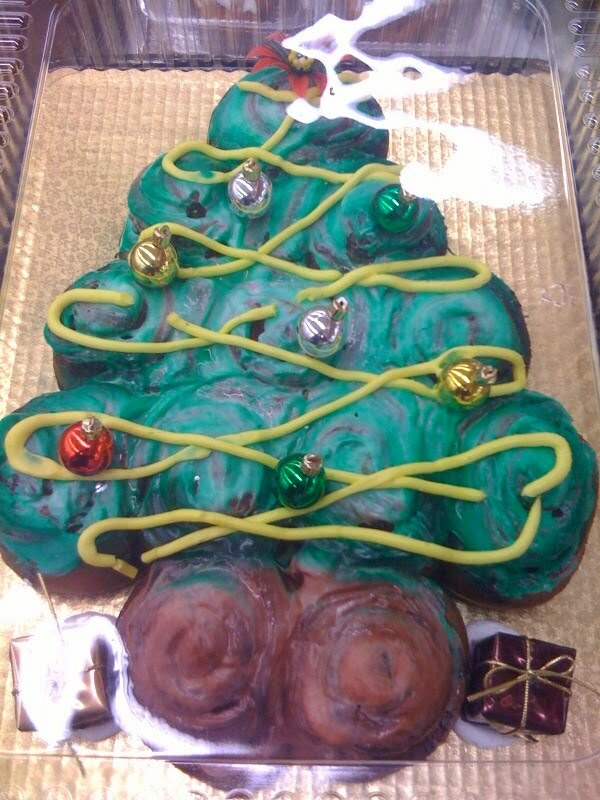 Although I think you could have spotted the "bun" part without my help. [smirk] Eh? Hey, Monica S., I hear there's a full moon tonight. The mission of today's charity, Free the Slaves, is to end slavery worldwide. They liberate slaves, help them rebuild their lives, and research real world solutions to eradicate slavery forever. Click here to donate your dollar through our First Giving Campaign Page. Look, I know sometimes it's only natural to spend your workday fantasizing about the many and colorful ways your boss/customers/coworkers could meet an untimely end - I do. That said, maybe someone should look into getting these Wreckerators a little group therapy time. Wow. 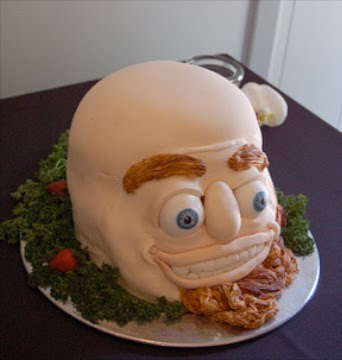 Who knew a cake could have such an open mind? This Just In: A bakery butcher is on the loose! Suspect should be considered armed and dangerous. [Mr. Bill voice] "Ohh Nooo!" "Oh, oh, oh! As if my merry man-jugs weren't disturbing enough." [shining flashlight in face all spooky-like] "And aaaall that was left was a Santa-shaped smear on the floor, with the name "Dallas" ominously written beside it - in blood." John's warning: The story below is very sad. Today's charity is something different, so I hope you'll bear with me. You see, on Tuesday night 27-year-old Amanda Buckland lost her husband, her 4-year-old son, her 8-month-old daughter, and everything they owned in a house fire. (The house they'd recently begun renting had no smoke detectors.) She and her 12-year-old stepdaughter only escaped thanks to a quick-thinking neighbor with a ladder. Take a second and think about that level of loss. I, for one, cannot even begin to fathom it. So today, John and I are donating to the Buckland Family Trust, which was set up by Amanda's employer. I hope you'll join us by donating your dollar, too. Click below to donate via Paypal, and click here and here to read the latest news stories regarding the fire. Also, many thanks to Kristie, who blogged about Amanda here. 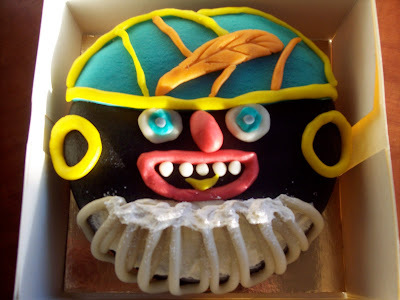 I Stream, You Stream, We All Stream For Icing!